Please feel free to join the new nitzer ebb facebook group called “power of voice communications”. You are welcome to discuss with other fans about the band or related projects as well. The neuwerk festival as well as the Douglas McCarthy DJ-Gig had to be cancelled for organizational reasons. At least the DJ-Gig shall be made up at a later time. The Neuwerk Festival will be take place too on december 30th at the Sportmax2 in Budapest / Hungary. A short call, but still enough time to go! Beside Nitzer Ebb, Rotersand and Soman will build the Line Up. 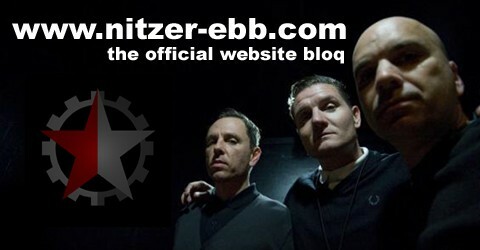 Check dates at nitzer-ebb.com for more details. The first european DJ-Set by Douglas will be take place in Budapest / Hungary on december 31st. All relevant gig information will be online soon. 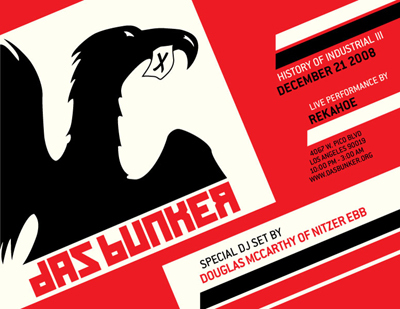 Short before another DJ-Set in Los Angeles at Das Bunker on december 19th. The party called History of Industrial Music. Electronic music fans will recognize the name Bon Harris as a founding member of one of the world’s most influential electronic acts – Nitzer Ebb. Apart from his own bands, he has done writing, production and programming work with artists such as Billy Corgan and Marilyn Manson. As an electronic musician, Bon relied heavily on large modular systems to create his music and often dreamed there was a way to make music on the road without hauling the whole studio on each trip. In the end, he found Reason. Being used to the modular approach, Bon Harris constantly finds himself patching audio and control voltages on Reason’s back panel. Only in software, it’s much faster and there’s an undo function as well. Propellerhead met with Bon Harris in Los Angeles to talk about his use of Reason in his production work and on the new Nitzer Ebb album. He also gave us a thorough lesson in how to craft a Nitzer Ebb-style bass patch using Thor, a vocoder and a mile of virtual patch cable – check the video! In the video, Bon Harris shows a trick for animating parameters using CV. We asked him to elaborate on that subject and he sent us an example file and a very thorough description of how his bass patch was created.